For too long, this great institution shunned the seemingly imperfect or non-conformists among the mince pie population and we must therefore shoulder at least part of the blame for the decline of civilised society to this unusually low ebb. Ushering in a new era for inclusivity and tolerance, our doors have been thrown open to the tart, the iced, the crumble top and even an Ecclefechan. Eight normals will compete to represent tradition in a grand final against the champion of the crazy eight. See tournament draw. Liverpool's famous Game Theorist, Holly Johnson, will have his furious 1980s hypothesis tested by the Two Tribes of Pie Club 2018, and he will have his answer. Two Tribes go to war, finally, in this most open of festive competitions. And with finalists that literally no one foresaw representing their brethren to decide whether ‘Normal’ or ‘Crazy’ pies will rule Christmas 2018. As my great uncle used to look me squarely in the eye and say, “We’re nearly all winners here”. Actually, I’m hearing the pointed ‘nearly’ now. Well neither of these winners have been in this position before, for differing reasons, so a new name shall grace our annals, and not before time, some might say. We hope you have enjoyed the new experiences made available, or at least described at moderate length, to you in our green pages, and we hope that we may have begun to reverse the descent of mankind with our all-inclusive new outlook. Who knows? 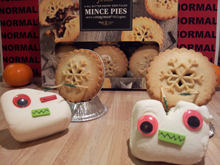 I’ll miss these strange creatures if planet Tesco decide to exterminate their terrifying motif for 2019, but I’m pleased they’ve finally gone deep into a mince pie knockout tournament. ET came home. Despite featuring in our Readers’ Pies page, courtesy of an earnest email submission, the ‘Fechan have had to stand and watch from the sidelines for years. It should come as no surprise that their pent up frustration has manifested into an aggressive pastry strikeforce. Traditionally steady in rim, Tesco do a decent job of sugaring up the nibble with modest amounts of sweet crystallised love. Texture on the top side of average. There’s no living with ‘Fechan’s outer though. Almost entirely made of butter, the snap is beyond compare and for your effort you are rewarded with a melting fat finish. Time for Tesco to bring the rain. A chunky downpour of walnut, cherry, peel and sultana pelts the palate, allowing the thunderous booms of mixed spice to shock the senses before the lull is reassured by branded cognac afters. Not quite a mic drop, but those alien eyes are smiling. Ecclefechan is unmoved, probably due to even more eggy butter stiffening its very soul, and I have to say that I’ve never met a pasty case containing more consistent or resilient inners. Post bite it will just stare back at you from its currant-dotted crust and I’m beginning to wonder if it will likely reform in my upper intestine once each bite is reunited. In many ways I wouldn’t begrudge it, as the heavy set mix of viners, nuts and the decorative glacé cherries combine to create festive perfection. If it helps, consider this a shortbread biscuit welded to the bottom of a tea-total fruitcake. 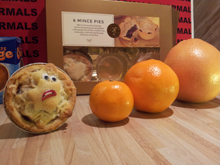 Extra pies once again will help resolve any outstanding matters in this fruity shootout. With the judgement still coursing through my blood system, I must turn to the much warranted thank yous. To Simon Wilson who continues to curate this curious webpage, beset throughout the year by good natured hackers, simply for the love of the game, #invoiceincoming. To my family who put up with an occasionally vacant look, and worse, as my mind wanders each Christmas, although the spare pies soften the blow. And to all whose social media gets clogged with the regular unsolicited nudges toward this divisive undertaking, thank you. Thank you and sorry. Have a great Christmas! And the winner is: Sainsbury’s Ecclefechan. 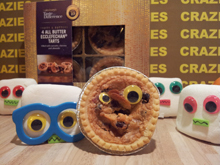 The Crazies take it with a mincemeat tart for the ages, and the Scot’s greatest gift to the world since Tunnock’s Teacakes. Finding a champion from the ‘normal’ side of the draw has felt a little like watching ancient knights mount their trusty steeds and charge bravely down the jousting field to eventually crown the new prince of mince. We must hope that they are not proved anachronistic in the grand final by the new type of warrior, the ill-bred beasts unwilling to fight by time honoured rules. Today’s contest will decide who is to test their mettle at the very edge of oblivion, by taking on the giant from beyond the wall, The Ecclefechan. Tesco have a patchy history, at best. Their most memorable performance came way back in 2012 when they topped the old style league table only to lose in the play-offs. Maybe by sticking with their current team for a few years now they have instilled a confidence as yet undiscovered on planet Tesco. 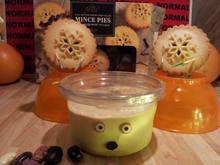 As close to mince pie royalty as it gets. This line has been competing, and conquering, since a time when Heston Blumenthal was merely an outsider chef, and the idea of tinkering with a mince pie was sacrilegious. They’ve been there and done it, but can they do it again? Tesco’s edging leads us off in a satisfactory manner, hitting markers for firmness and sweetness. If we are being generous, there’s a touch of shortness in this crust. The elderly M&S matriarch needs much gentle coaxing to remove her golden foil cloak, but that is where the languid demeanour ends. Crisp butter twangs provide a steely shell for the citrus dance to follow. This semi is in danger of petering out if Tesco cannot respond. Luckily, the cognac fired secret within is quick about its work, creating a spirited chew so varied in micro-flavours and texture that we begin to re-believe in these extra-terrestrial wonders. To make such a critical decision it is only fair to play another round, to crystallise whether it’s going to be the perfect outer with an ultra zest or the secret keeper of a nutty treasure chest. And the winner is: Tesco Finest. Unbelieveble scenes as they taste their first ever knockout victory over the golden girls of M&S.